It seems to have been a very long week here in "Fee" land. I looked after our 4 year old grand daughter for 2 days in a row during the week and that always seems to tire me. So I have declared today a rest day. I have the Hobart Handmade Market tomorrow so will save all of my energy for that. 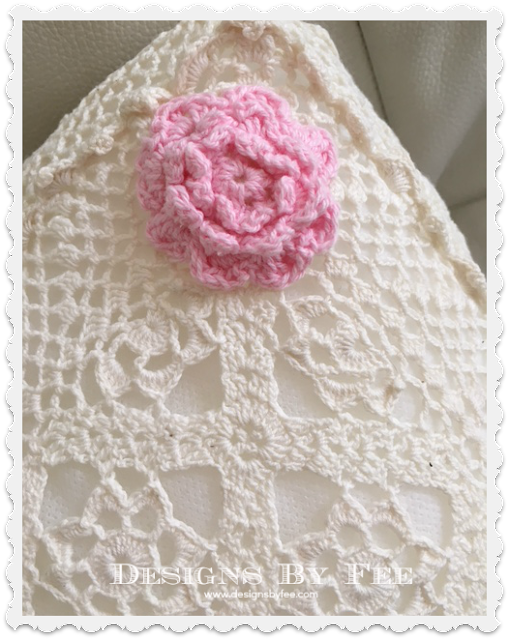 Here is a little lace cushion cover that I discovered a few weeks ago. I gave it a good clean and added some little pink crochet flowers. A very gentle upcycle for this pretty little thing. Have a great Friday in readiness for your weekend. 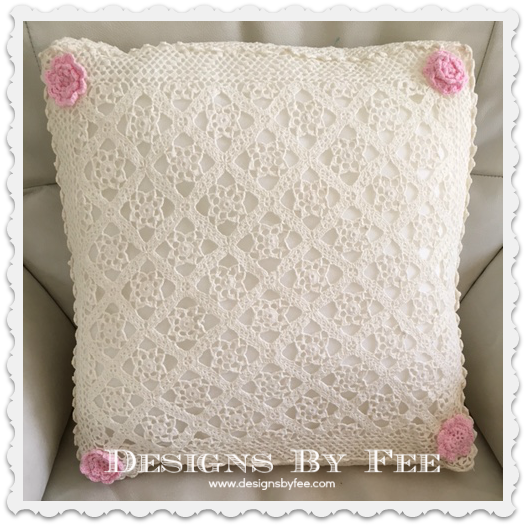 I love this wonderful lacy pillow. The pink roses really makes it. Beautifully recycled. I'm very much into recycling / up cycling . I make all my Christmas cards from old card fronts. I have a rather tacky rei ndeer( covered in glitter ,most of it falling off) that I bought for £1 which a quick rub down and a coating of brown paint will spruce up beautifully to pull the sleigh I'm making as a display. Have a lo lovely relaxing day. Hugs Mrs A.